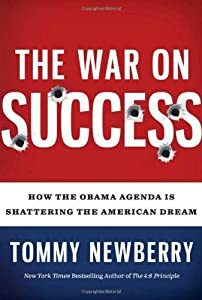 I am currently reading a book by Tommy Newberry, The War on Success, this is, by far, one of the best books I have read on the current state of the country, and what the Obama presidency means to America. Mr. Newberry uses facts, passion and humor to deliver a message that all Americans need to hear. The Obama administration has declared WAR on the American way of life. They are actively undermining the innovators and job creators to help push along there socialistic agenda like no other administration in history, and Mr, Newberry lays it out in simple, fun to read English (you know the language we all should be speaking in America). This book looks at the American dream, breaks it down and delivers a solid one two punch to the liberal social democrats who believe that the Europeans way of governing a nation should become the American way. By looking at American history, the founding fathers and other political leaders, Mr. Newberry gives a compelling voice to the conservative movement. And his faith in America and God comes through clear as a bell. You will have no doubt that he is a true American and a patriot to boot. The War on Success should be on everyone’s reading list, a book that every teacher, union worker and politician should have to read. It is a book I will recommend to all my friends and of course to all of you. If you read one book this year on politics, I would recommend this one, Mr. Newberry makes it a fun read with plenty of chuckles and tons of hard hitting facts and a touch of distain for the current direction of American policies. And for the faithful, he has included a whole chapter on God and Socialism, using the Bible to defend capitalism, making this the perfect gift for the liberal priest, rabbi or minister you listen to each week. Using quotes from the bible and saints he defends the American way and makes the argument for prosperity and profits. I will soon finish reading Mr. Newberry’s book, The War on Success, and I know I will be a better American because of it. This entry was posted in America, Conservative, faith, Freedom, GOP, history, Liberal, Life and tagged administration, agenda, america, American, americans, argument, bell, bible, boot, capitalism, chapter, creators, direction, English, Europeans, faith, fathers, Friends, Gift, history, language, leaders, Life, message, movement, nation, Newberry, Obama, Passion, patriot, policies, politician, politics, presidency, Priest, profits, quotes, Socialism, teacher, Tommy, tons, worker. Bookmark the permalink.